Have you ever thought about the possibilities of bendable, stretchable electronics? They're amazing. From a circuit attached to your brain to a pacemaker that sticks to your heart, these are the stuff that medical sci-fi dreams are made of. There's only one problem: Stretchable electronics are notoriously impossible to make. At least until now they were. A team of engineers from the University of Michigan are currently perfecting an unassuming but incredible invention. It's an elastic gold conductor. 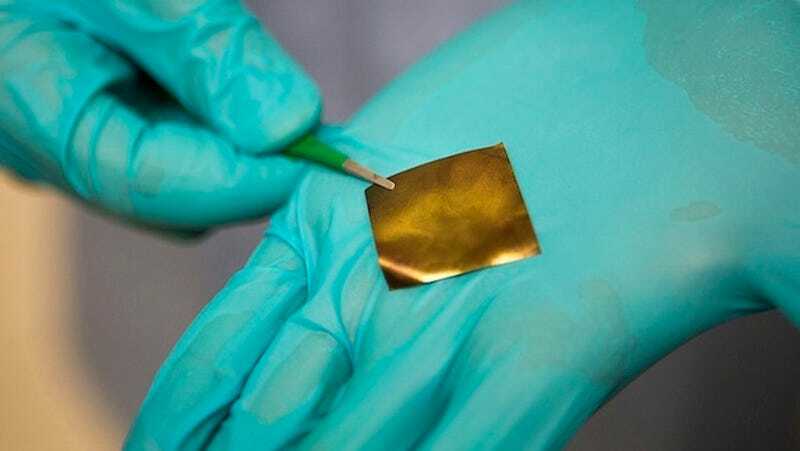 Made up of gold nanoparticles and stretchy polyurethane, the material just looks like a piece of foil to the naked eye. But after watching it stretch out four times its normal size, it's obvious that this conductor is something else. As Nicholas Kotov, one of the chemical engineers who created the material, explained to Wired: "It looks like elastic gold... but we can stretch it just like a rubber band." This is a big feat. The problem with developing stretchable conductors is that the two characteristics, in the words of the Michigan team, are "fundamentally difficult properties to combine." Stretching a conductive material makes it less conductive, and stretchy materials tend not to be very conductive in the first place. This is because as a material stretches, the molecules rearrange themselves, and the electrons are spaced further apart. In the past, the best way to make stretchable electronics was to bend or coil up conductive wires so that when they stretch, the circuits just unfold. With the new method, however, the material can be stretched to four times its size while still holding onto its conductive abilities.